While there are many things that you love about Singer Futura CE-150, there are things that you hate as well. You either love it or hate it. CE-150 is not a new entrant in the market, it has been here for a while. It is a sewing and embroidery combo machine, however it focuses more on embroidery. 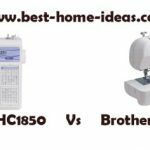 The sewing features are comparable to that of a $100 – $120 sewing machine. There are 24 built-in sewing stitches including 2 one-step buttonholes. You can’t call Futura CE-150 as a computerized embroidery machine, because it isn’t. You can call it a ‘computer-linked embroidery machine’ as you need to connect the machine to a computer in order to use it as an embroidery machine. 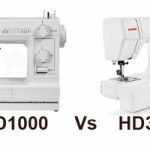 Singer’s point is that it will reduce the cost of the machine when compared to a stand alone embroidery machine with built-in screen for editing (not exactly, sometimes the price is over the roof). All the editing is done on the computer with the help of an included software. One thing I am really impressed with Singer CE-150 is the embroidery area. It is quite large for an entry level embroidery machine. Two embroidery hoops come with the machine, Large (4-1/2 by 6-3/4 inches) and small (3-1/8 by 4-3/4 inches) . There are 120 built-in embroidery designs and 5 built-in fonts for monogramming. You can even download more designs from the internet, which gives unlimited creativity options. The automatic needle threader threads the needle in a snap. The auto tension feature ensures consistent stitch quality across light, medium and thick fabrics. There is a vertical spool holder in addition to the standard horizontal one. This offers the much needed flexibility to work with cone style threads and larger spools. The extension table has a built-in accessory storage compartment. Remove the extension table and you can access the free arm for sewing tubular areas. Drop feed for free motion sewing can be easily engaged by using a lever. The programmable needle up/down button is fundamental for quilting and pivoting. Top drop-in bobbin with clear cover allows you to monitor the thread supply. In the regular sewing mode, stitch patterns are selected by pressing the buttons on the front. Stitch length and width are automatically set for optimal results. However, you can customize them for personalized results. The maximum stitch width is 7mm. The locking stitch function lets you tie off stitches with the push of a button. Reinforcing stitches add to the stitch quality. To accommodate multiple layers of fabrics, CE-150 has an extra-high presser foot lifter. 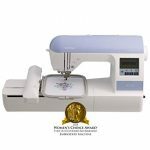 The automatic presser foot pressure lets you sew variety of fabrics without any pressure adjustments. The 3 staybright LEDs offers good illumination of the workspace. Singer CE-150 comes with 25 year limited warranty. 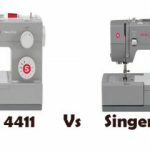 Setting up Singer CE-150 won’t be a problem for anyone who has used a sewing machine before. The machine is easy to thread. The 24 built-in sewing stitches are enough for most tasks. The larger embroidery area is a real blessing, you can feel the difference especially while doing multiple designs. 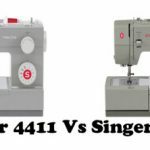 Most prospective buyers compare Singer CE-150 with Brother SE400, which comes in the similar price category. But the Brother machine has a smaller 4″x4″ embroidery area whereas CE-150 almost touches 5″x7″(not quite, the actual embroidery area is slightly lesser than that). Importing the designs from the internet is very easy. You can also rotate the designs. Any person with basic computer knowledge can use the included editing software. The error alarm system alerts you if something is wrong with the machine. However, I have mixed feelings about the included software, which I will discuss in the next section. The stitch quality is good, but not excellent. Auto punch software is not included. It is an additional purchase. With auto punch, you can covert cliparts into embroidery designs. The included editing software won’t work on mac computers, it will work only with Windows computers (come on Singer, you are better than that). The software is very basic and the designs are a bit old. The user manual requires a lot of improvement. For most, it has been a love-hate relationship. It either works well or fails miserably. To me, Singer CE-150 lacks consistency in its offerings. I would rather recommend Singer Futura XL-400 or Brother SE400 than this one. 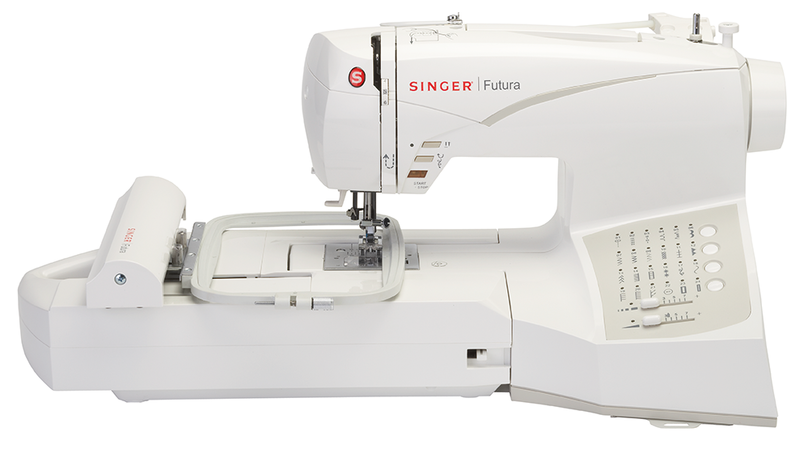 Singer Futura XL-400 has better features (larger embroidery area,stitches etc) than CE-150 and has better stitch quality. If stitch quality is your top priority and if you are happy with the 4″x4″ embroidery area, the best option is to go for Brother SE400. It is the best of the best, which is the reason why it features in our list of “Machines You Can Buy With Your Eyes Shut”.